Give someone an enchanting journey through an English garden with a charmingly natural blend of flowers in a classic clear glass vase. They'll be thanking you for weeks for such a grand gesture. 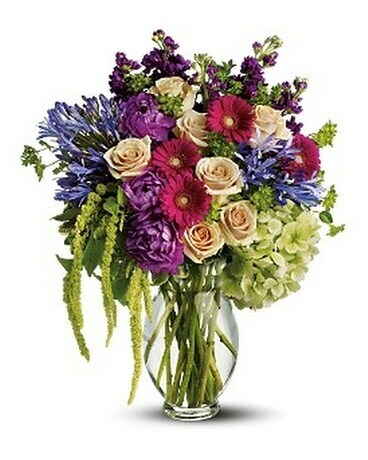 A spectacular blend of flowers including green hydrangea, purple stock, agapanthus, crème roses, fuchsia, miniature gerberas, purple dahlias and green hanging amaranthus. Accented with fresh greenery, and delivered in a sparkling clear glass vase.